Why Haven’t I Heard About Pituitary Injuries Before? With 2.5 million emergency room visits in the US each year for traumatic brain injury related injuries, why have we not been aware of pituitary problems sooner? Simple math tells us that 14.3% of 2.5 million TBIs results in over 357,000 TBIs in the United States – and that’s from motor vehicle accidents alone. The numbers from slip and fall cases are even higher, and these are only the ones that end up in the ER rooms. 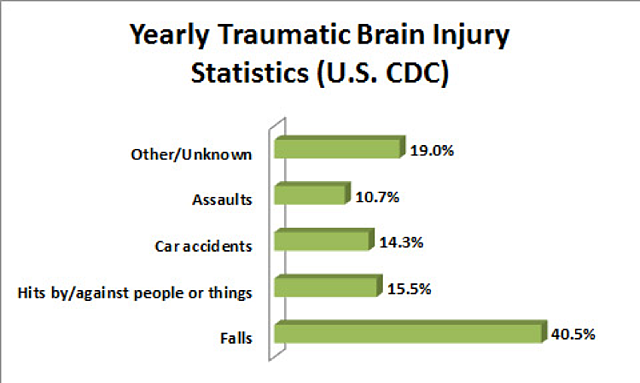 In fact, the number is actually much higher since many TBIs go undetected for days or weeks after the initial trauma. Research shows that roughly 30-50% of these TBIs alone have pituitary issues, which is a problem that can’t be ignored. Why hasn’t this been discussed sooner? For probably the last 30+ years, endocrinologists have suspected that TBI injuries were also responsible for pituitary damages. However, for whatever reason they did not get out of the “endocrinology” paradigm and start to look at the problem systematically, asking questions about how a TBI and pituitary damage might interact and collectively cause a constellation of traumatic brain injury symptoms that could easily and objectively be explained as the result of trauma. For years, the endocrinology community and the neurological community were like two ships passing in the night, and nobody ever thought to start linking damage to the pituitary – the “master” gland – and its resultant effects on behavior and bodily functions to TBI injuries. In the last 12-15 years, researchers and doctors in both fields have begun to jointly pursue this question. The results of this joint effort has been very intriguing, and will have dramatic effects upon how we handle TBI cases in the future. More research is being done currently, and will continue to shape the way in which TBI cases are evaluated at the outset. In fact, one recent study now says the standard of care in child TBI cases should be that a pituitary screening occurs within six months of the onset of TBI. The purpose of this screening would be to help determine whether it is a TBI/cognitive or hormonally mediated change in one’s mental functioning, and if so, whether hormone replacement therapy is warranted. The Department of Defense has also gotten on board, and after having sponsored research on pituitary damage amongst veterans returning from Afghanistan and Iraq with blast related TBIs, it too will be starting to test all of its veterans for this problem and offering hormone replacement therapy to help these veterans get their lives back in order. Similarly, with former NFL players, a recent study also noted a high level of pituitary damage amongst former NFL players. Pituitary damage is an emerging issue that we at Brain Injury Law of Seattle are out in front of, getting our client’s the help they need. The medical community is only marginally aware of the strong correlation between TBI and pituitary problems, and we take it as an ethical and moral obligation to help our clients get the care they need so they can lead better lives and reclaim some of what they lost following a TBI.